The Dead Sea Water Project Working Group proposes restoration of viable flow for the Jordan River in connection with their project for saving the Dead Sea. 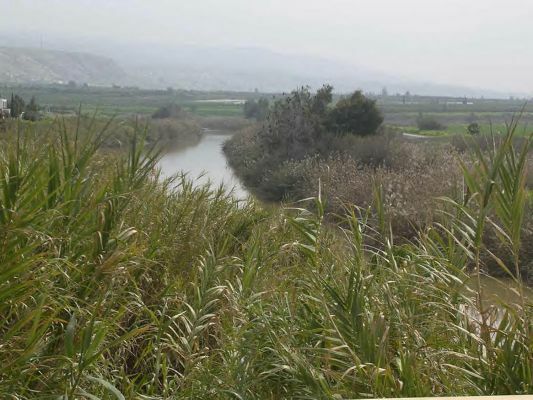 Since the early 1960s, 1.2 billion cubic meters annual flow has been removed from the Jordan River, leaving it dependent on sewage to remain low enough in saline to enable continued use for irrigation. It is in danger of drying up completely. AMMAN: The Jordan River, where Christians believe Jesus was baptized, is heavily polluted with sewage and is in danger of drying up after decades of conflict and intense agricultural use, environmentalists said on Friday. In the early 1960s, the Jordan moved 1.3 billion cubic meters of water every year from the Sea of Galilee to the Dead Sea. But dams, canals and pumping stations built by Israel, Jordan and Syria to divert water for crops and drinking have reduced the flow by more than 90 per cent to about 100 million cubic meters. "The Jordan River will disappear if nothing is done soon. More than half of it is raw sewage and runoff water from agriculture. What keeps the river flowing today is sewage," Munqeth Mehyar, chairman of Friends of the Earth Middle East (FOEME), an Israeli-Jordanian-Palestinian group, told Reuters. Next month, FOEME says it will host an event in which Israeli, Jordanian and Palestinian mayors will jump into the Jordan as part of a campaign to clean up the dying river. The dramatic decline in the Jordan is the main reason why the Dead Sea is also vanishing. The level of the world's saltiest large body of water is falling by a metre each year and the sea could disappear in 50 years, experts say. Years of conflict between the main users of the river -- revered by Christians, Muslims and Jews -- have contributed to the crisis. The river meanders for 200km along the lush Jordan Valley, separating Jordan, Israel and the West Bank. "The story of the demise of the River Jordan is the competition between Israel, Jordan and Syria for water. It is about grabbing as much water as they possibly can," said Gidon Bromberg, FOEME's Israeli director. The Dead Sea Water Project plan can make possible 500 million cubic meters desalinated water annually for renewing the Jordan River. The water would be produced by a desalination plant on the north end of the Dead Sea, taking feedwater from the layer of Med Sea water to be placed on top of the Dead Sea by the planned DSWP. Desalinated water would be pumped via pipeline to just below the Sea of Galilee, providing potable water for use in the Jordan Valley between the Sea of Galilee and the Dead Sea. Unused water would be dumped into the Jordan River and allowed to flow back toward the Dead Sea, being collected for irrigation water just above the Dead Sea. Why call it Ezekiel's Water Project?